Villa Zadar has WI-FI, 6 parking spaces, sun deck with lounge chairs, gazebo with outdoor kitchen and large fireplace that allows the preparation of authentic specialties (grill, skewer). 530 m2 interior spans four floors, a garden 630 m2. The beautiful sandy beach of Punta, one of the most beautiful in the Zadar region, removal of Ville Zadar 150 m, and there are all the facilities that holidays and vacations at the beach are filled and interesting for all ages: a coffee bar, tennis courts, beach volleyball, pancakes, hire a boat for fun, diving school. Many activities are available in the area: walking, running, biking trails, beach volleyball, bowling, surfing, basketball, sailing, children's summer basketball camp, sailing, rafting on Zrmanja, paintball on Velebit. Villa Zadar is a holiday home which has 5 apartments for rent, whose floor plans, landscaping and equipment in all respects satisfy your desire for comfortable accommodations that enables technological equipment of a relaxing holiday. Each apartment has an intercom, air conditioning, Wi-Fi, LCD satellite TV, clothes horse, oven, kettle, hot showers. Cot and high chair available on request. 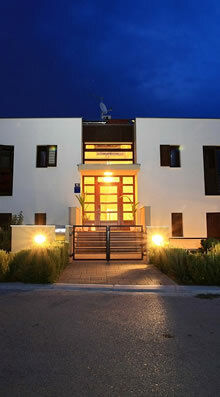 The apartments are named after national parks that are near Ville Zadar, one named after the neighboring town - Zadar. 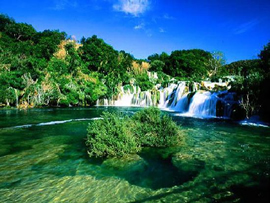 Few of these sites have any Villa Zadar, which within a radius of 50 kilometers have so many natural phenomena; National parks Kornati, Krka, North Velebit, Paklenica, Vrana Lake and Park. Beautiful sandy beach Punta one of the most beautiful beaches in the Zadar region, and away from Villa 150 meters and it contains all the amenities that a beach holiday are filled and interesting for all ages: a coffee bar, two courts for volleyball, coffee couple, pancakes, rent various facilities for play and fun on the water, diving school. 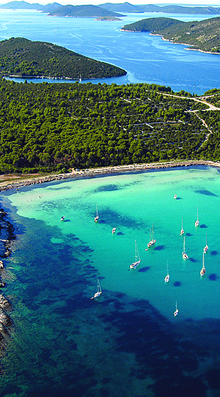 Kornati are a paradise for the senses! In the central part of the Croatian Adriatic, Šibenik and Zadar town, there is a separate and amazing group of islands named Kornati. Because of the beauty, interesting geomorphology, indented coastline and rich marine life, the year in 1980. most of the Kornati archipelago was declared a national park. NP "Kornati" occupies an area of ​​approximately 220 km2 and includes 89 islands, islets and rocks with approximately 238 km of coastline. Despite this relatively large number of islands, land of the park makes less than 1/4 of the total area, while the rest of the marine ecosystem. Learn the rich history of Dalmatia while during your vacation walking the cobbled streets and squares! 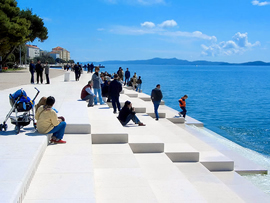 Relax while walking Zadar (5 km) and walking celebrated Kalelarge let you carry her liveliness and energy, listen to sea playing on the world famous and unique instrument-sea organ, the sun, and you witness the beauty of the church of St.. Donata. Visit St. Vitus Cathedral. 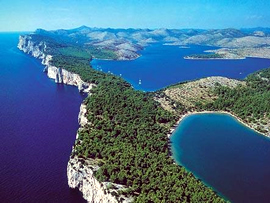 James in Sibenik (80 km), which is due to its beauty and value is on UNESCO's World Heritage List. 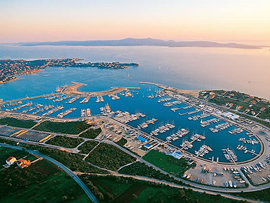 Experience the charm of small towns Biograd and Nina (25 km). When during your holidays in Dalmatia wish to swim wild secluded beach, when you wish to look stunning countryside or want to enjoy a voyage in the Adriatic sea, rent a boat to suit your needs and discover the most beautiful unspoiled parts of the unique coastline! Paklenica National Park stretches on the littoral slope of South Velebit directly above the settlement Marasovići, to the zone of the highest peaks (Vaganski top, top Babin, Sacred Hill) - between 15 ° 23 'and 15 ° 35' east longitude and between 44 ° 18 'and 44 ° 25' north latitude. 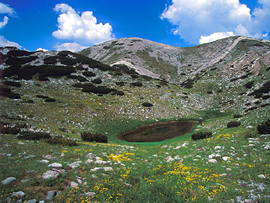 It covers an area of ​​torrent flows of Velika and Mala Paklenica, and their distinctive canyons carved vertically into the south slopes of Velebit and the broader surrounding area. The relatively small area has an abundance of geomorphological phenomena and forms, diverse flora and fauna, attractive landscapes and intact nature. According to the IUCN, which defines eight categories of protection of natural areas, Plitvice Lakes belong to the second category - the national park, which means a protected area under management, primarily for ecosystem protection and recreation. The first cartographic records lakes are found in the drawings from the 17th century, and are mentioned in the records of the second half of the 18th century. Name of Plitvice in literature first entered far in 1777. year. Already nineties 19th century gave birth to the first organized initiative to designate a protected area lakes. Thirties of the 20th century academician Ivo Pevalek first scientifically explained the reasons for the protection of lakes. Studying the growth of moss and algae concluded that the formation and growth of travertine, which participates in the construction of geomorphological forms lakes, the most important and most sensitive biogenic process that is "the essence of lakes." These scientific findings and the efforts of academics Ive Pavelek led up to the historic date of April 8th in 1949. when the Plitvice Lakes were declared first Croatian national park. Even before, especially after getting the official status of protection, this area was the subject of many scientific studies. That's raised a lot of knowledge about the natural values ​​of Plitvice Lakes National Park, which has "only" tufa-forming waterfalls and world famous cascade lakes, but also a wealth of geomorphological forms, forests and grasslands, razoliku flora and fauna, cultural heritage, and finally the tourist offer of the largest Croatian national park. Learn the rich history of Dalmatia while during your vacation walking the cobbled streets and squares! 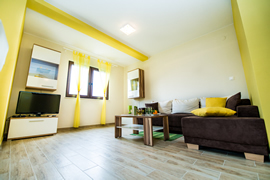 Apartment Krka provide a special "sun" atmosphere because of the somewhat bold, interesting and unusual combinations of interior design with warm green and yellow hues. Let carries vibrancy of this apartment! The master bedroom has a king bed, private wacky yellow bathroom with spa shower and washing machine. The room has a French balcony with a view of the well-kept olive groves. The second bedroom with a king bed available with a bathroom that is located near the bedrooms and living room and has a view of the centuries-old olive trees and lawn. Each bathroom is equipped with a massage shower, sink and toilet. Internal bathroom without daylight has incorporated ventilation fan, hot shower, sink and toilet. The spacious living room has a sofa, which can be converted into a comfortable bed for two, a glass with dining table for 6 people and a kitchen with a refrigerator, freezer, oven, electric glass hob, extractor fan, kettle, coffee machine and all other necessary inventory (dishes ...). The living room overlooks the masts of boats in the marina and the olive and cherry trees in the cultivated garden. Terrace apartment has direct access to the lawn where you can sunbathe or play a sport. The apartment is located on the ground floor has 80m2, 2 bedrooms and 2 bathrooms. The apartment has intercom, air conditioning, Wi-Fi, LCD satellite TV, hairdryer, ironing board and iron, clothes horse, oven, kettle, coffee maker, toaster, 2 hot showers. Cot and high chair available on request. 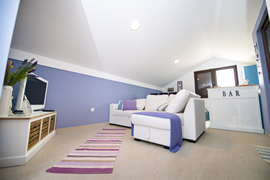 Apartment Kornati its refined shades of black and white design with the odd purple detail, few people indifferent. The master bedroom has French forged bed, private luxury black and white bathroom with hot shower and washing machine. The room has a French balcony with a view of the well-kept olive groves and the sea. The second bedroom with a king bed available with a bathroom that is located near the bedrooms and living room. Each bathroom is equipped with a massage shower, sink and toilet. Internal bathroom without daylight has incorporated ventilation fan, hot shower, sink and toilet. The spacious living room has a sofa, which can be converted into a comfortable bed for two, a glass with dining table for 6 people and a kitchen with a refrigerator, freezer, oven, electric glass hob, extractor fan, kettle, coffee machine and all other necessary inventory (dishes ...). The living room overlooks the masts of boats in the marina and the garden with cherry blossom. Terrace apartment has direct access to the lawn where you can sunbathe or play a sport. 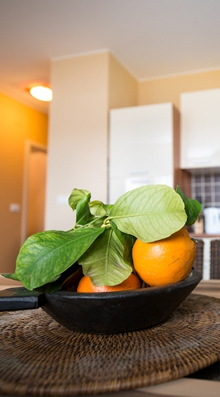 The apartment is located on the ground floor has 80m2, 2 bedrooms and 2 bathrooms. The apartment has intercom, air conditioning, Wi-Fi, LCD satellite TV, hairdryer, ironing board and iron, clothes horse, oven, kettle, coffee maker, toaster, 2 hot showers. From Velebit apartment offers a beautiful view, with each apartment windows to see the view, on the one hand the islands of Pasman and Ugljan, on the other hand Sukosan Marina Dalmacija and her beautiful vessels. Decorated in shades of blue and "water" details, this apartment is the most typical marine. The master bedroom has a king bed, private purple blue bathroom with spa shower and washing machine. The room has a French balcony with a view of the beautiful views of the sea and olive groves. The second bedroom with double bed and sea views available with a bathroom that is located near the bedrooms and living room, which is decorated with a mosaic of separate drops of water. The spacious living room has a sofa, which can be converted into a comfortable bed for two, a glass with dining table for 6 people and a kitchen with a refrigerator, freezer, oven, electric glass hob, extractor fan, kettle, coffee machine and all other necessary inventory (dishes ...). From the living room look far reaches of the islands, the masts of boats in the marina and garden. The balcony offers a spectacular view of the impressive marina with thousands of vessels. The apartment is located on the 1st floor, has 80m2, 2 bedrooms and 2 bathrooms. The apartment Paklenica offers a breathtaking view of the Adriatic Sea, and earth tones, and somewhat exotic natural materials furniture soothe you and give the impression of connection with nature and the earth interior. The master bedroom has a king bed, private purple orange white bathroom with a hot shower and a washing machine. The room has a French balcony with a view of the beautiful views of the sea and olive groves. The second bedroom with a king bed and a view of the sea has exotic flooring, and there is specific and mosaic bathroom which is located near the bedrooms and living room. Each bathroom is equipped with a massage shower, sink and toilet. Internal bathroom without daylight has incorporated ventilation fan, hot shower, sink and toilet. The balcony offers a spectacular view of the SUKOŠANSKA Marina Dalmacija and neighborhood. Apartment Sukosan any visitor does not leave you indifferent - very airy and bright apartment is " candy " that is on top of the Villa Zadar . Even with two terraces , apartment Sukosan provides on the one hand the unique open view on the island of Pasman , followed by the Kornati National Park , on the other hand a beautiful view of the marina Dalmacija which is especially magical at night . Terraces for its architectural solution allows complete privacy and peace - until you see everything , you do not see one ! Planned as a combination of shabby chic , Mediterranean and modern design , the apartment is very comfortable to stay , and has an area of ​​60m2 and a total capacity of 4 persons . The spacious living room has a sofa that can be made into a comfortable bed for two people , with dining table for 6 people and a kitchen with a refrigerator , freezer , oven , electric glass hob , dishwasher , kettle , coffee maker and all other necessary equipment (dishes ... ) . The spacious bedroom has a king bed and an additional sofa. The apartment has Wi-Fi , LCD satellite TV , clothes horse . Cot and high chair available on request . 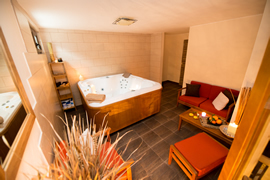 The four spacious suites can accommodate 24 people, and then the guests have a common living room and kitchen (with a bathroom that is equipped with a massage shower, sink, toilet). Then the whole area of ​​the villa and garden house and the entire exterior only at your disposal! 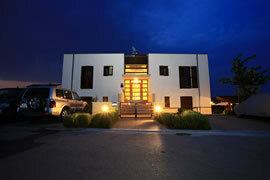 The total area of ​​the villa is 530 m2, a garden and parking 650 m2. Possibility of chefs and waiters who speak foreign languages ​​24 hours a day. For complete rest and regenraciju body and mind, relax in the wellness Dalmatia Zadar Ville is a symbiosis of natural wood Scandinavian fir handmade saunas and heat of volcanic stone, high-tech massage pool, holistic principles of interior design using earth colors and exotic wood, shells and natural stone, aromatizing oils and candles and serving natural teas and citrus. Wellness is located on level -1. Using wellness by prior arrangement and agreement. 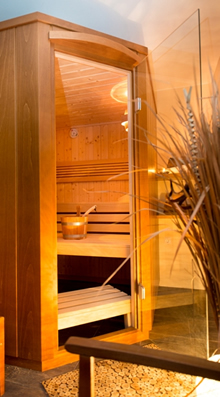 Ensured privacy with respect to only one apartment in one period may use wellness. Straight and clear lines of glass, wood and stone used in interior design, in accordance with the airy and subtle colors of its ease of creating harmonious refinement houses with a touch of luxury and a perfect setting for a holiday home in Croatia! Atmosphere fragrant Mediterranean garden plants contribute rosemary, lavender, orange, fig, mandarin, olive, sage that adorn the carefully groomed gardens surrounding the house, and that its minimalism emphasizes the refined simplicity of the house. Single morning silence that surrounds Villa Zadar disturbed only by the occasional sound of distant sails from Sukosan marina Dalmacija that rocking due to a slight breeze.